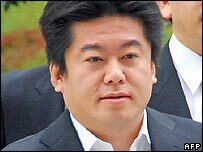 Controversial tycoon Takafumi Horie has been found guilty of fraud, following a six-month trial which has gripped corporate Japan. The former boss of the once high-flying internet firm, Livedoor, was found guilty of falsifying the company's accounts and misleading investors. Horie, 34, was sentenced to two years and six months in prison. His lawyers say he will appeal. The disgraced entrepreneur had pleaded not guilty, saying he was framed. But Chief Judge Toshiyuki Kosaka said Horie had overseen a network of decoy investment funds, "established for the purpose of evading the law" and to "manipulate Livedoor's accounting". Unlike many previous corporate scandals where businessmen have confessed their guilt in return for more lenient sentences, Mr Horie maintained he was innocent. The tycoon accused the prosecution of targeting him for standing out too much with his brash, unconventional entrepreneurship. Prosecutors had demanded a four-year prison term. Speaking at a news conference following the ruling, Horie's chief lawyer, Yasuyuki Takai, said his client would make an appeal by the end of the day. "I cannot understand why there is a prison sentence. Regrettably, my disillusionment with the Japanese criminal justice system has only gotten worse," he said. He said the case was based on ambiguous evidence and the testimony of two former Livedoor executives who have already pleaded guilty to similar charges. Horie was extremely popular with a new breed of investors for his informality of style and business ambition, which saw Livedoor expand rapidly in a short space of time through a series of daring takeovers. But Horie's high public profile, which saw him stand for parliament and date a number of leading actresses, put him at odds with Japan's conservative business establishment. Livedoor was raided by prosecutors at the start of 2006 after allegations of financial impropriety surfaced and Mr Horie was subsequently arrested. He was accused of falsely reporting a pre-tax profit of some 5bn yen ($43m) for the year to September 2004 to hide actual losses of 310m yen. The Tokyo stock market was forced to close briefly when news of the investigation triggered a massive share sell-off. Four senior Livedoor executives admitted their guilt, with former chief financial officer Ryoji Miyauchi acting as a leading prosecution witness. The case centred around how much Mr Horie knew about the state of Livedoor's finances and whether he conspired with other executives to inflate profits. 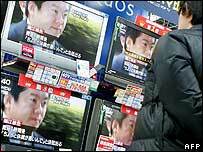 Critics of Horie's actions have described Livedoor's fall from grace as a "Japanese version of Enron".